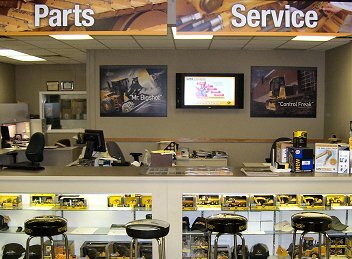 Ontrac Equipment Services Inc. “Ontrac,” a leading John Deere distributor with 22 dealerships in Eastern Canada was seeking a way to update its parts department counters and present customers with attractive, up-to-date information at the point of sale. It discovered StrandVision Digital Signage could deliver the goods. Ontrac sells John Deere construction, forestry and compact machines through 22 dealerships in Ontario, Quebec, Newfoundland and Labrador. As a full-service provider, its parts department is not only a major profit center, it also presents an ideal opportunity to inform customers about the company's products and services. Chris Holmes, Vice President - Parts, recognized the opportunity to leverage parts sales. He explained, "We were looking at ways to increase the revenue side of our business by focusing on and growing our parts sales. We also wanted to update and refresh our parts department." He discussed his ideas with Clark Johnson, his counterpart at Nortrax, Ontrac's parent company, who told him about the StrandVision digital signs that they were using in Nortrax' U.S. sales locations. Chris further researched Nortrax' digital signage installations and then contacted StrandVision, which arranged an online demo of Nortrax' signage. Chris decided to pilot StrandVision Digital Signage installations in two locations, London and Mississauga, Ontario. London was first up because that's where Ontrac's IT department is located and Chris wanted to be able to quickly address any IT issues that could arise. The strategy worked well. "There were no IT issues. The IT guy was actively involved right from the get go. Now, as we roll this out to other branches, it should be plug and play. He knows exactly what we need. He knows what computers - what cables - what brackets. It's just a matter of organizing the labor and away we go," said Chris. The installations themselves are straightforward. Each branch already has a high-speed Internet connection. The personal computer is generally located in the parts manager's office, electricians install the necessary power and cable connections, Ontrac staff handles mounting the monitor and IT does the hookups. The 42" LCD digital screen in London is located directly behind the parts counter. It displays almost 50 slides that feature John Deere and other vendors' equipment, Ontrac maintenance programs and services, local weather, and local and national news. The rotation also includes two John Deere demonstration videos which spice up the presentation. Customers sit at the counter and look at the digital sign while the counterman is looking up parts or doing paperwork. Although it's too early to directly attribute sales, Chris says that a counterman "noticed that people are looking at the screen longer than they would look at the brochures that we have sitting on the parts counter. It's an effective way of advertising." Developing the content went smoothly. They didn't have to create their slides from scratch since StrandVision worked with Nortrax to modify the Nortrax template. Day-to-day administration is handled by Francine DeGouveia in the Marketing department. Francine participated in a one-hour online training session with StrandVision and now simply logs onto the StrandVision administrator's console to update the slide deck. "I'll give her a suggestion - we want to do a certain promotion - and she'll come back with a couple of slides - Francine does the actual artwork." Chris is happy with the results. "In all honesty, they [StrandVision] were great in all of our dealings. Francine was very complimentary to them." He has since added Mississauga and is adding two more installations. "It will contribute - it definitely will contribute to the results. I would do it again - that's your best measure," he concluded.